WinADay Casino has added the first of three new penny slots to be introduced during its sixth birthday celebrations this month. 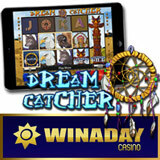 You can play the new Dream Catcher, a Native American-themed penny slot, on your desktop or laptop computer or, like all of the unique casino’s penny slots, on iPhones, iPads and Android phones and tablets. Happy birthday -- WinADay now has 50 unique slots and video poker games! Logon June 12– 14, 2014 and you'll find $8 Free added to your account so you can take a few free spins on the new Dream Catcher slot game. WinADay will add a 35% match bonus to all deposits made between now and Saturday midnight. Dream Catcher’s symbols include a majestic Timber Wolf, an American Eagle, a Bison, and an Indian Chief in feather headdress. The expanding wild is a Totem Pole that stretches to cover all positions on the three reels. Three or more Pick Bonus symbols triggers the Bonus Game where players choose one of three dream catchers to reveal their instant bonus prize.